The barren inside of Grand Canyon University Arena was an eerie sight, considering that a basketball game had been played there just a few days earlier. The seats in the upper half of the bowl had been removed, and plastic sheeting covered the remaining seats to protect them from the work that is to come. The basketball floor was gone, leaving the bare cement. Scoreboards and other electronics were stored elsewhere. The south end of the Arena will undergo a radical transformation, as seen in this rendering. Outside, two doors on the south side were in the process of being removed along with the walls above them and the bricks between them. Planners said it was the only way to create a space big enough to get a crane into the building. This week, the jackhammers were scheduled to begin dismantling parts of the 2 1/2-year-old facility to make way for the new upper-deck seating that will expand capacity from 4,328 for basketball to about 7,000. Don’t think it hasn’t crossed the minds of the people charged with making it so, including the coordinator of the original project, Bob Machen, GCU’s senior vice president for campus development. “It will be a very intense thing. Since we’re a Christian university, we’ll be praying a lot,” he said, smiling. So here’s how they’re going to do that to fulfill the goal of holding Chapel there on Monday, Sept. 8: mostly double shifts, mostly seven days a week to allow for what Machen calls “hiccups” or “oh crap days.” The right lane on westbound Camelback Road often will be limited to construction traffic. The easy part, Machen said, was taking everything out. Putting the Arena back together will be more challenging. “You have to know instinctively,” he said. That’s where Michael Hallmark of Tutor Perini Building Corp. comes in. 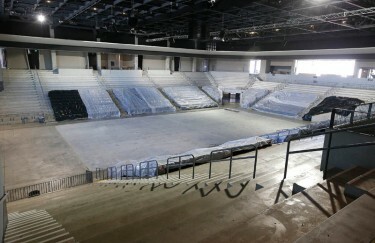 Named by Sports Business Journal in 2004 as one of the “20 most influential persons in the design and development of sports facilities,” Hallmark managed the building of the Arena and is in charge of this project — one of the reasons GCU’s president and CEO, Brian Mueller, said he thought it could be done so efficiently. Hallmark, whose company’s website, appropriately, says its focus is on “large, complex projects with aggressive schedules,” also oversaw the building and then the renovation of US Airways Center, and he said that adding new features to relatively new buildings is a trend in the industry. 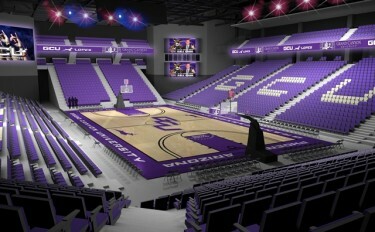 Mueller said the renovation idea was hatched when GCU’s application to switch to NCAA Division I in athletics was accepted in late 2012: “We believed we would get there, but we thought it would take longer.” The main order of business was to maintain the intimacy of the facility, and Mueller gets excited as he gazes at an artist’s rendering of the new upper deck, which will go all the way around with an extra deck above it at the south end. The lower deck at that end will be retractable, creating room for events that require a stage, such as Chapel, concerts and commencement. Mueller pointed out that GCU next fall will have 6,000 students within a three-minute walk of the Arena. “You don’t see that,” he said. “It’s so unbelievably convenient.” Combine that with the way Phoenix’s west side and Christian communities have adopted GCU, and Mueller is confident that putting 7,000 people in the seats for basketball games is more than doable. Average attendance of 7,000 would have ranked 73rd among Division I schools, right behind Fresno State and Seton Hall and just ahead of Ohio, Mississippi State, Baylor and Nevada. The Pacific 12 Conference average was 7,631, and it was that high only because UCLA had the largest increase (3,196) among all schools. UCLA was the only D-I school to increase its attendance by more than 2,739, but that spike can be attributed to the renovation and reopening of UCLA’s famed Pauley Pavilion coupled with the fact that the Bruins played in the run-down Los Angeles Sports Arena the previous year. This season, with the excitement over the “new” Pauley having subsided, UCLA attendance was down again, and significantly, according to a Seattle Times report on Feb. 11. It was below 8,000 a game, a drop of 17.8 percent, and attendance was down at six other Pac-12 schools. Oregon State, Washington, Washington State had seen drops ranging from 17.7 to 41.2 percent, reducing the conference average to 7,173. The Western Athletic Conference average in 2012-13 was only 3,249. Averages among some of the current WAC schools: New Mexico State 6,213, Seattle 2,726, Utah Valley 2,275, UMKC 1,235, Idaho 1,097, Chicago State 811 (up from 429 the previous season) and Texas-Pan American 694. The Missouri Valley, a mid-major conference with a long basketball tradition, averaged 7,270, but that was inflated because only two MVC schools, Creighton (17,155) and Wichita State (10,312), averaged much more and Creighton has since left the conference. Take away Creighton and the average would have been just 5,873. Butler, which played in the NCAA Tournament championship game in both 2010 and 2011, averaged 7,899 at legendary Hinkle Fieldhouse, and Gonzaga, a perennial power, averaged 6,000, which is the capacity of its arena. How the north end will look in the renovated Arena. A bigger arena means the opportunity to attract more big-name opponents. New Mexico, Tulsa and three-time Ivy League champion Harvard all are scheduled to come to GCU in December, and the Antelopes are tentatively scheduled to play at Kentucky. 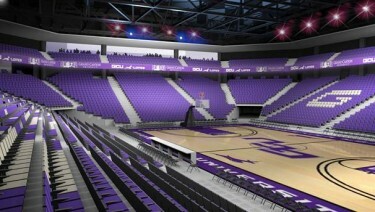 Keith Baker, GCU’s director of athletics, said negotiations are under way to play another prominent opponent as well. “One thing that came up in basketball scheduling is that some of the larger schools were hesitating to play here because we didn’t have a lot of seats,” Baker said. The advantages go beyond basketball. As GCU keeps growing, commencement exercises and Chapel services will need to accommodate more people. Having more seats would enable graduates to invite more family members to commencement, and Chapel crowds have approached 3,000 in the last year. With an additional 2,500 students being added to the campus population in the next school year, Chapel attendance figures to rise. 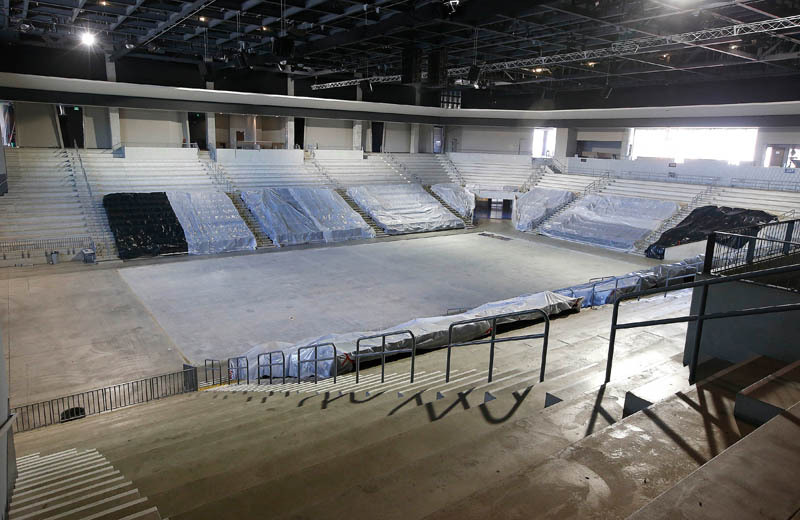 The increased capacity also will give GCU the opportunity to attract higher-profile concerts to the Arena, said Cathey Moses, GCU’s vice president of event planning and marketing. Before, there were about 5,500 seats for concerts; now that number will be 6,800 when the stage is at the south end of the building and 7,200 when a show is done in the round. Already, the Christian band Casting Crowns — which opened the Arena in the fall of 2011 — has been booked for Sept. 19. So here we go, GCU. It will be only 190 days between events at the Arena if everything goes as planned … and people have come to expect that. Expect to be wowed, too. From eerie sight to a whole new vision in just six months. You can already hear the roar.